Run out of your size? Click here to join the waiting list. A cropped short-sleeved button-down is always a good choice for days when you’re looking to dress a little on the masculine side. That’s where the Orr Shirt comes in handy. 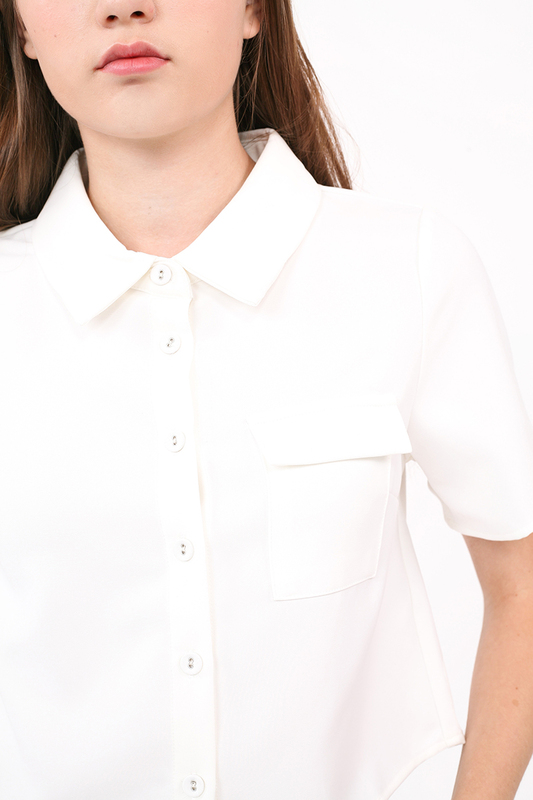 Featuring a full button placket and cute single breast pocket, it is as basic as shirts come. Style it with anything from jeans and shorts to lightweight pleated skirt. Shoulders 13.5" 14" 14.5" 15"
Bust 16.5" 17.5" 18.5" 19.5"
Sleeves 8.25" 8.5" 9" 9.5"
Length 17" 17.5" 18" 18.5"
Bust: 29.5" / Waist: 24" / Hips: 34.5"
For more information on International delivery, click here. We want you to receive only the best from us, so if you have a burning question or a feedback about anything at all, drop us a message here and we promise to get back to you as soon as we can.